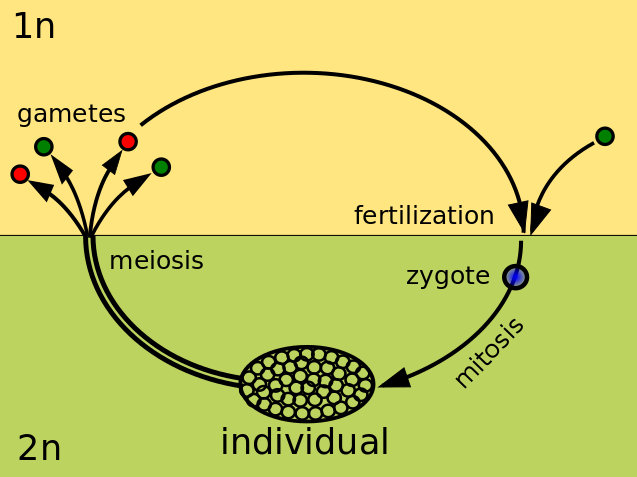 Inside the appropriate gametophyte, antheridia produce sperm and archegonia produce eggs, haploid gametes which join through fertilization to form the diploid zygote, bringing us back[ref]“…by a commodius vicus of recirculation…”[/ref] to the beginning of the cycle. 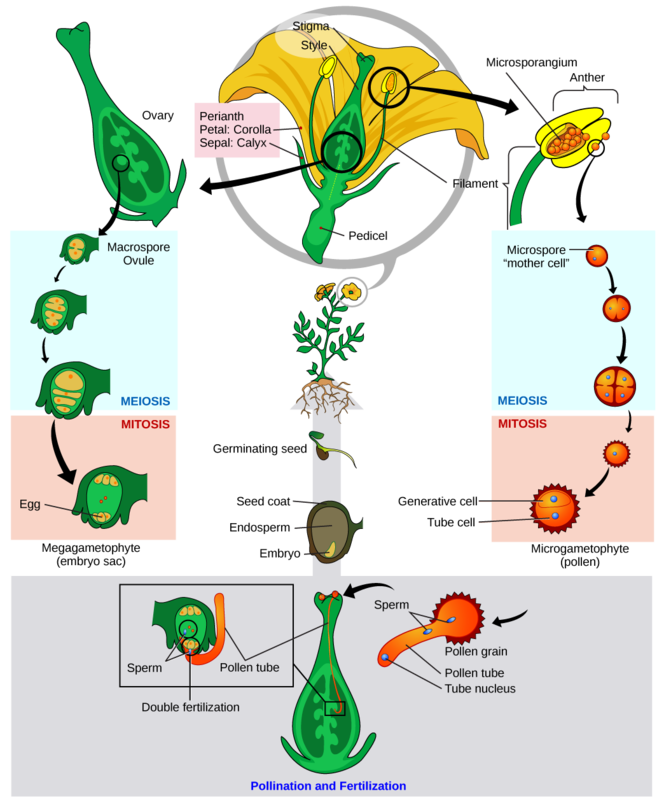 Generically, antheridia and archegonia are called gametangia. A fern is a seedless vascular plant and its dominant state is the diploid sporophyte. The tiny dark-colored objects under the fronds are spore-containing vessels called sori. [ref]Singular, sorus. [/ref] Ferns are homosporous and their gametophytes are independent of the sporophytes. 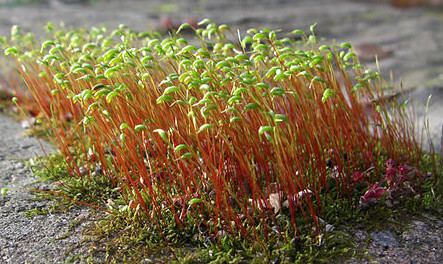 Gymnosperms are non-flowering seed plants, like conifers or the gingko. [ref]Also called at least in French, l’arbre des quarante écus. [/ref] The tree is the diploid sporophyte phase. 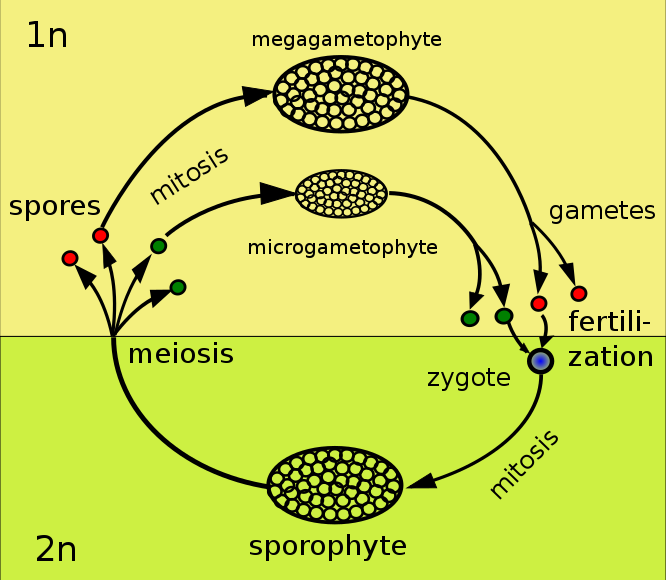 Conifers are heterosporous: The male gametophytes lives in the smaller, pollen cones lower on the tree; the female gametophyte is in the form of the harder, upper ovulate cones. Wind carries the pollen from the male cones to the female ones. From the original two suggested kingdoms of 1735, we are now up to six in the latest suggested version. [ref]There are various mnemonics for remembering the order. My favorite is “King Phillip came over for good spaghetti”. Other versions vary in the word “spaghetti”…[/ref] This document will stick with the three – Bacteria, Archaea and Eucarya – we have been using so far. The system is most simply explained by some examples. Plant taxonomy is very different, using different terms for Domain, Phylum and Class, so we will skip them.